Welcome to Work In Progress Wednesday! Where I post all the things I put on Instagram this week that were not the things on my to do list! I've almost sewn down the first round of these EPP rings. I printed enough papers to make nine rings, figuring that was a good wallhanging size, and once I finished them, I'd know if I wanted to continue making more. With round one nearly complete, I can safely say that I love these and the process. So now it's on to round two! And maybe printing more papers. I mounted another customer quilt on the long arm. It's a beautiful Meadow quilt (with yummy Liberty prints) and I have free reign on the quilting. I love the original Meadow that was quilted by Angela Walters, so I'm going to use that as inspiration for my quilting. First step is to draw draw draw! These swirls will make up the borders, and since the borders are a huge part of the quilt and solid I need to make sure the swirls are as close to perfect as possible. And I couldn't let these scraps sit any longer by my sewing machine! I won them from Ashley (check out the quilt they came from!) and since they've arrived I've pawed through them a couple times, separated them out into piles, and pulled some bits for possible projects, but hadn't actually done anything. So I pulled out my solids bucket and got out all the colors that went well. In addition to the greens and pinks, I also added a reddish orange, brown and yellow. I'm not sure that the red really needs to be there, and I think that I might need to add a bit of white. But I really love the two greens and that pink. 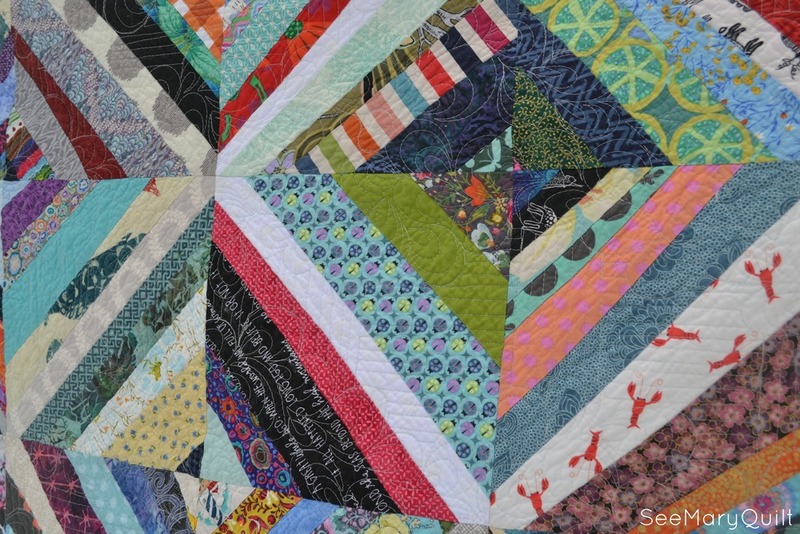 It's time again for the Blogger's Quilt Festival over at Amy's Creative Side. If you're visiting from there, welcome, and if not, you should go check it out. There's so many great quilts to look at and reading their stories is so much fun. Anyway, this is my entry for the Scrappy Quilts category, and it is the scrappiest quilt I've made. These strips were from the tear off bucket at the fabric shop I worked at briefly. When we got new bolts in we'd rip off a few inches because the initial cut from the factory can be very warped. So this quilt is a little bit of every fabric we got into stock during my months there. The quilting on this one is also special to me. It was the first thing I quilted after coming back from QuiltCon. I was so full of inspiration and new knowledge, and I just pumped it all into this quilt. It was super fun to do. You can read my other post about this quilt here. And go check out all the quilts in the festival! In the fall, the Seacoast Modern Quilt Guild is putting on an exhibit on modern quilting at the Gathering Quilt Show in Manchester, so we decided to have a little challenge to get everyone in the spirit. Everyone picked out a traditional block and our assignment was to modernize it using only solids. I pulled the Snake in the Hollow block, which is really just a Drunkard's Path block with eyes in the corners. I didn't know what I was going to do with it, but I knew I wanted a bunch of colors to play with, so I ordered a charm pack of Denyse Schmidt's Modern Solids. Once the pack arrived, I started sketching out ideas, but in the middle of one doodle, I'd have another idea. Before I knew it, I had several pages of colorful doodles, and couldn't decide which one to go with. So I pulled the very first idea I had, made a tiny drunkard's template, and made a couple test blocks (remember this tiny mini?). But I realized that I really didn't love making those tiny curves, and couldn't stand making more. So I picked a different sketch! So I went with the one idea I had that didn't involve sewing all those curves! I pieced a bunch of the solids together, on point, and trimmed it to size. Then I made a mile of bias tape to do the curves, and realized that it was not going to be a very smooth curve. 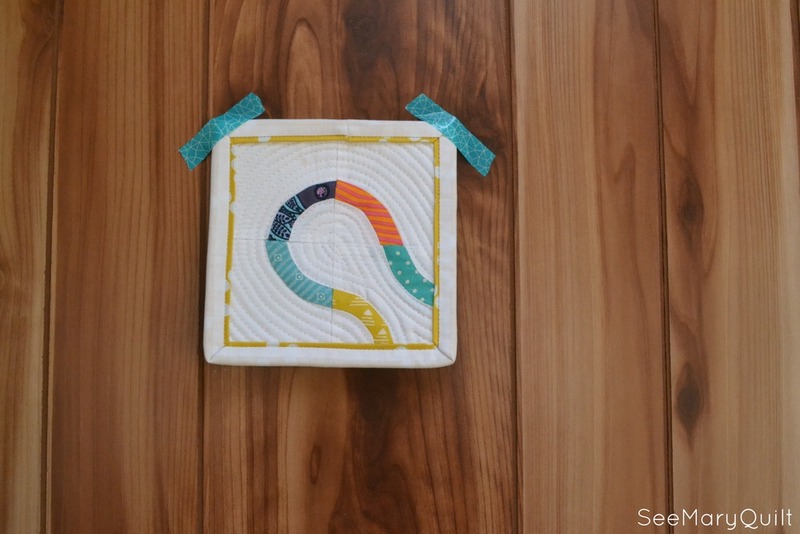 Then I found this post by Dorie about her Bias Tape Applique Challenge quilt. She talks about using bias bars to get really skinny strips to sew down. I loved the idea, so I just used the technique without buying the bars. As soon as the top was done, I knew I wanted to graffiti quilt it, and that I would need monofilament to make it work with all those colors. I absolutely hated working with the stuff (it took ten tries to wind a bobbin, the tension was weird, and where there was buildup, it gets a bit shiny) but it worked out in the end. I named it Rainbow DNA because it was super late the night (actually morning) it was due when I finished, but I needed a title for the label, and I couldn't stop thinking that all the straight lines between the curves looked like a flattened strand of DNA. Yeah, I'm weird. Linking up with Amanda Jean for Finish It Up Friday! And this is one that I can cross of my 2015 Finish-Along list! And one more link! Finished just in time to be entered into the Applique Category of the 2015 Blogger's Quilt Festival! Be sure to go and check out all of this year's great entries! So there I was on the couch this morning, enjoying a cup of coffee, watching some Daily Show, when I realized that there was a deadline looming over my head! AHHHH! I'd signed up for Pat Bravo's Quilt for Project Linus challenge, received my lovely pile of scraps, made a top, then sat on it for a month. I knew how I wanted to quilt it, had backing fabric in mind and in stash, and had a clear spot on the long arm, but still let it just linger in my to do pile. Anyway, the quilts need to be mailed by Friday, and I already have a full couple of days, so I'm glad I realized all that this morning and not tonight. It's already on the long arm and in progress! And in other news, my little EPP project is coming along nicely! I've pieced together a bunch of these rounds, and I'm now working on appliqueing them onto my black backing fabric. Once I get the first set sewn down, I'm going to reuse my papers and start on another set. We'll see how many times I can repeat the cycle before I'm tired of these shapes. Welcome to my little bit of internet! I'm glad you've found me in that massive list of amazing giveaways over at Sew Mama Sew! I hope you like what you see and click around on my site. I love sharing my projects on this blog and on my main page, my love of long arm quilting. And now onto the fun stuff. I'm a scrap quilter at heart, so for my giveaway, I'm giving away two scrap packs from Hawthorne Threads! They always have amazing fabrics stuff into them, and in pretty generous cuts. And I love getting little bits of new fabrics to play around with; it's way easier to cut into than yardage and a great way to just sample all the latest colors and prints out there. Leave me a comment telling me which two packs you'd like. They come in Cool, Warm, or Fresh. And if you're feeling chatty, let me know in what kind of projects you'd use them. For a second entry, follow me however you follow blogs and leave a second comment telling me where you're doing that. You have until Sunday, May 10 at 5 p.m. PST to enter. I will use the random number generator to draw from the comments and announce the winner on Monday morning. Please make sure I can find you! Leave an email address in your comment if you aren't sure! And be sure to check out both lists of giveaways over at Sew Mama Sew!!! So instead of a nice proper Friday Finish post I have a bunch of mediocre iPhone photos from my guild's retreat. But there was so much fabric sewn, that I had to share. My first finish was right off the bat. I plunked down my machine late Thursday afternoon, got out my pile of scraps sent to me by Pat Bravo for her Project Linus quilt project, and got to work. I had a bunch of oddly shaped scraps, and wasn't really sure how they would go together. But I remembered the scrappy geese that Heather from House of a la Mode had made and went from there. I used Heather's measurements, because I liked the scale her geese had, but instead of using a paper foundation and making them striped, I just made slabs then trimmed down to 8.5 inches to subcut into my geese. Then, fellow guildee Sarah suggested adding more white space to add more quilt to my quilt since I'd used up just about all my scraps. I'm still debating adding white borders around all the sides. I think I need to, but there's more projects to work on first. I love that pink star with the butterfly center soooooo much! Anyway, I had such a fun mix, but I wanted to make sure I did something that would let the big prints sing as well as the tiny prints. 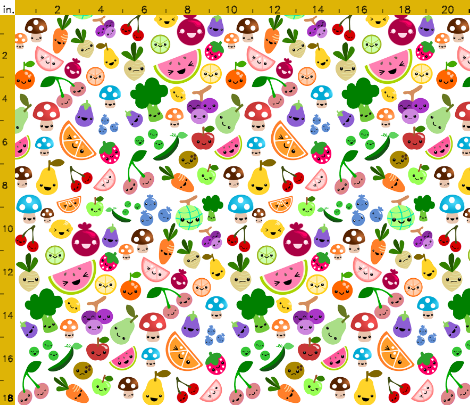 Also, I just love how Lizzy's fabric lends itself to fussy cutting, so I wanted to do some of that too. I decided on the Sparkle Punch pattern from Elizabeth Hartman and got to work. After an afternoon of cutting, sewing, and trimming (why is there so much trimming!) I had a mini. Now it's in the pile of things to be quilted. The very last project I tackled was the massive pile of Tina Givens fabric that my friend and I have been collecting. It definitely deserves it's own post, so let's just say that our first encounter with Tina was a scary, angry unicorn print that was too confusing to not buy, and we keep finding more and more that confuses us. We had quite a lot of different prints, and wanted a way to calm them down, so I made the executive decision to do half rectangle triangles and attempt to sort our prints by value. At this point, my chevrons had taken shape, but weren't always well defined, but by the end of the retreat, I'd finished all my HRTs, rearranged a bit, and started sewing them into rows. I can't wait to finish these quilts (one for me, one for my friend), because they still makes me scratch my head and giggle. And now back to the sewing!! So this one time I worked at a fabric shop. It was great times, but it ended. And when it did, they let me take the strip pile home with me. The shop ripped their fabric instead of cutting, which meant when we got new bolts in, we'd rip off a bit to start with a nice ripped edge. We'd use the strips to bundle up fabric or hang stuff, but we could never use them fast enough, so the box of strips became a box and a bag. And out of that bag, I've made one pretty big quilt so far (it's the "lines and paisley" quilt on the main page. Someday I'll get around to binding it and taking some proper pictures of it.) That quilt got all my favorite strips, meaning what was left is mostly not my taste. So the best way to make lemonade out of these lemons is to add crazy to crazy and cut it up small. Here's what I'm making, six inch wedges to make up hexagons. So here's a little tutorial of what I've done so far. The first step is to sew a bunch of strips together. I didn't want to trim anything at all, so I went for mostly straight. Then I starched and pressed the warp out of it as best I could. Since I'm going to cut it into smaller pieces, just getting mostly straight is enough. The most important thing is to make sure you've got the height you want. I'm going for six inch tall wedges, so I want about seven inches of fabric to make sure I have enough room to trim out the warp. Then you line up the 60 degree line of your ruler with a horizontal line on the mat and cut. Just be sure to save those end pieces. You can use them later to square up the ends of your rows. Now line up the other 60 degree line and cut the other side of your triangle. When you do the third cut, you'll be making a triangle with the strips going in the opposite direction, giving you two different looking triangles from the same starting fabric. Stack up all those triangles and line them up with the 60 degree mark on your mat, making sure the point is on the line (mine are a little off to show you the dashed line). Now you just have to measure six inches up (easy with a six inch ruler) and trim off your excess fabric. Be warned, if you aren't really paying attention, this could mean that you trim right on or before a seam. I'm pretty cool with that since I know my machine will sew through any seam I ask it and I'm going to quilt this to death, but if you don't want that, just be mindful of where you seams are when you sew the strips together in the first step. Ta Da! Pretty quick and easy, and my pile of strings is slowly going away. I can't wait to sew all of these together; when this much craziness gets together it's a fun surprise to see the end result. Linking up with Alyce for Sew Cute Tuesday and Lee for WIP Wednesday! The whole place is trashed! I normally try to keep my sewing stuff to the left side of the dining room table, but I just have so many things going that I've migrated to the right. Family may not get a decent meal here until I leave for QuiltCon. I've been sewing up some new clothes. I know I don't really need any more, but it's kind of fun to make clothes where you'll be around people that will really get it. And any excuse to buy fabric is a good excuse. So far I've done one horrible muslin and scrapped that entire pattern. Then I went back to the old standby, the Washi Dress. One needs a hem, and one is finished. I just have that Brambleberry Ridge fabric in the back there to go. I'm thinking of adding some short sleeves to it, just so they aren't all complete duplicates. And, I've thrown together a lanyard and a new business card holder. I'm debating whether I should make a new bag for Con, or just reuse one of the many I've already made. For now, I'll wait, but if I get the itch, I may end up elbows deep in interfacing in the middle of the night. And when I'm not sewing these days, I've been working on this Corvallis Cardigan for my son. He's pretty excited about it and keeps checking in on my progress, but I'm so BORED of it! He just wanted a green sweater, so there's no stripes or color-changing yarn to keep me interested. And I realized too late that I should have put something in, a cable or an interesting stitch, but I didn't. Linking up with Lee for WIP Wednesday and Lorna for Let's Bee Social! I was so excited to get my partner's information for the Schnitzel and Boo Swap. She seemed pretty much my quilty twin, so I decided to just make something that I would love to receive. On the long list of designers that we had in common, Tula Pink was right on top. And I just happened to have been hoarding a pile of Tula from my time working at a fabric store. I pulled a fun pile of all my blues, purples, and teals, yellow for a pop of color, and added in my raccoons. She also loved Anna Maria Horner, and I needed some navies, so I added the feathers and coordinates. I spent a lot of time trying to figure out the block I would make. I've loved minis where the blocks make secondary patterns where they meet, so I scoured the internet. At first I thought I would do nine blocks that were six or seven inches square, but then I found this block and decided that it would look cooler with just four blocks. Also, the center would be perfect for the raccoons if the block was bigger. I went a little crazy with the quilting. When it's such a small space to quilt it's pretty tempting to quilt all the little spaces to death, which I did. I only left the raccoon alone because I couldn't figure out how to quilt them. And once it was all done, I thought it looked nice without quilting. And here's the mini I received. My partner saw that I loved Latifah Saafir and when she looked into her, my partner fell in love with the Big O quilt. I love the idea of passing on quilt inspiration! She did a really great job; it's bright and graphic and has my favorite Carolyn Friedlander print all over it! Can't wait to figure out where I'm putting my mini wall so I can hang all my new minis. Linking up with Amanda Jean for Finish It Up Friday and Leanne for TGIFF! WIP Wednesday: Snow Day Number Two! So it snowed all day yesterday. Sure everyone knows about the blizzard, and everyone got snow, but it never stopped! I don't think we've ever had a storm that didn't at least take a 20 minute break in the midst of snowing. Yesterday, while we were all penned into the house, I managed to get a binding done and a bunch of pressing but today I decided it was quilting day! Last night I pulled backing and batting and got it all loaded up on the long arm so I could just start as soon as the coffee kicked in. Luckily, once you get started, it's pretty easy to just keep going. And one more picture of the snow. Lucky has decided she likes the snow in the North better than the heat of the South! So my job today is to get these quilts bound. Both are gifts that are long overdue, though no one is expecting them, so no one knows they're so late! Ha! in the mail. So I'll probably just go and get to it! So I kind of fell off the internet. It's that Christmas crafting rush, but mine starts before Thanksgiving, and then I'm just pooped. I make things, but just don't feel doing the last step, blogging them. Luckily, I kept up with the photographing, so now that I have my mojo back, I still have pictures of stuff that I've sent away. So now I can show you what I was up to when I was away! This was the second center I've worked on for our Round Trip Quilts Bee. (The first one is here.) Jenn, from Never Just Jennifer, and I was in love with it the second she posted it to Instagram. I was glad I didn't have to wait long to get my hands on it. She's a fellow New Hampshire-ite, and wanted a quilt that was all about our awesome state. Her notebook was full of great ideas, like those maple leaves, mountains, snowflakes, and flying geese. I got this at the height of geese migration when all the fields are full of flocks coming and going, so I had to do some flying geese. The last step was the corner. Red again to mirror that red maple leaf, and some Anna Maria Horner blue. It's called Migratory Lace, so I kind of had to use it prominently, and it reminds me of trail maps, and NH has some great hiking and skiing trails! I love this one, and can't wait to see what happens to it next!